This shocking outburst was not a cheap attempt to attract attention to herself: she has no need of that. Each phrase uttered by Pugacheva in public becomes as popular as her songs were in the USSR of forty years ago. Whenever she appears in public, Alla Pugacheva is trailed by hordes of journalists, and any particularly intrusive reporter insulted by her feels like a courtier slapped by a queen. It is all part of the image of the Tsarina of Russian pop, the only Soviet star to survive the passing of the USSR. Alla Pugacheva’s first song hit the national state radio airwaves in 1965, the year she left school. Given the absence of other radio stations in the USSR, it became an instant resounding success. To discharge her ideological duty, the young singer was required to spend some time touring the Polar regions as part of the ‘Youth’ channel’s outreach team and work for a while as a schoolteacher. But Pugacheva wanted to be the centre of attention and achieved her goal relatively quickly. She was fortunate in her timing. The end of the 60s saw the Soviet leadership’s final rejection of Khrushchev’s communist experiments and the transformation of the USSR into a state capitalist regime and consumer society, albeit in a limited form. Pugacheva was an instantly recognisable figure in Soviet Russia, achieving a popularity that the country's leaders could have only dreamed about. A anecdote of the time: In 2030 a teacher asks a student, who was Leonid Brezhnev? A diligent pupil answers: "he was a small-time bureaucrat during the epoch of Alla Pugacheva"
This altered the role of popular music. People were tired of eternal virgins with modest necklines exhorting them to go and build communism in Siberia, or rehashing the tale of Cinderella. If a woman sang about a man, he could only be her husband or fiancé, or a platonic friend. Now a pop singer could declare her feelings and passions, admit that her man had walked out on her, that they hadn’t been married anyway, and that she had been left with a child. An echo of the West’s sexual revolution had reached the USSR. "Pugacheva’s songs were criticised for their vulgarity, sentimentality and eroticism. But they were good of their type: she collaborated with the Soviet Union’s best composers and songwriters, and also performed settings of poetry by the semi-forbidden poet Marina Tsvetaeva and the totally forbidden Osip Mandelstam." Pugacheva was lucky, but she also fitted this new permissive image better than any other female pop singer of the time. As well as her voice, she possessed a whole array of talents, including the ability to make friends and extract herself from tricky situations. In 1972, for example, she lost her Komsomol membership card just before she was due to go to Poland for a festival. It could have meant not only the cancellation of the trip but expulsion from the Komsomol and effectively the end of her pop career. But at the disciplinary hearing she exclaimed, “I don’t want to go to Poland; I want to be in the Komsomol”. It worked – she got to Poland, kept her career and got a new membership card. Alla Pugacheva likes reminiscing about plots against her by people envious of her fame, harassment by party officials and other such disagreeable moments. Once, for example, at a concert in East Germany she took off her shoes for a moment and someone stole them. She had to go on stage in her bare feet, and although they were invisible to the audience, one of her colleagues reported her to the group’s Party representative and she was officially reprimanded. Despite small incidents like this, by the middle of the 1970s Pugacheva was the undisputed Tsarina of Soviet pop. Every concert turned into a real show. She alternated happy, upbeat numbers with dramatic love stories. Teenagers and middle aged women were equally certain she was singing to them. “My ex came back to me when he heard your song ‘Come’”, one fan wrote. In the song an abandoned woman begs her husband to come round for an hour, or even for just a minute, to see her and their little girl. Pugacheva’s songs were criticised for their vulgarity, sentimentality and eroticism. But they were good of their type: she collaborated with the Soviet Union’s best composers and songwriters, and also performed settings of poetry by the semi-forbidden poet Marina Tsvetaeva and the totally forbidden Osip Mandelstam. There was a newspaper story about a teenage girl going into her local library and asking for Shakespeare’s sonnet. It turned out she had heard Pugacheva’s song ‘A Shakespeare Sonnet’ – his 90th, in a translation by the eminent writer Samuil Marshak. 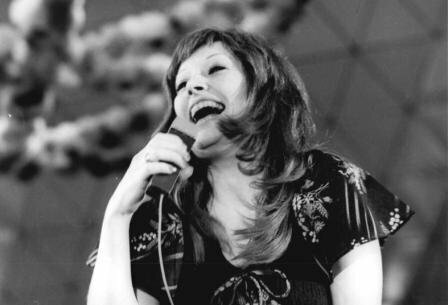 Alla Pugacheva’s acclaim had no parallel in the history of Soviet popular music. In terms of prestige, a ticket to a Pugacheva concert was on a level with a jar of black caviar or a pair of authentic American jeans. Legend has it that the poster for a concert in one of the major cities was so dull that everyone thought it was a scam. Up to the day of the concert most of the tickets remained unsold. When she heard, Pugacheva left her hotel and wandered along the main street. By the start of the concert all the tickets were gone. Soviet political writers criticised Pugacheva for her lack of conformity to Communist ideals and Russian national traditions. “We have to remember that ours is the country not only of Alla Pugacheva, but of Emelyan Pugachev”, declared the writer Vasily Belov (Pugachev was the leader of the largest Cossack-peasant revolt in Russian history). Rumours abounded of her lovers and her enormous earnings, inexcusable for a Soviet citizen. The Party leadership took no notice of these grumblers. They enjoyed Pugacheva’s concerts too. And any Party official would have been only too glad to have a lover with an image like Alla Pugacheva’s, even though such an affair would inevitably have led to expulsion from the Communist Party. Pugacheva’s last ‘Soviet scandal’ took place in 1987: she bawled out at the manager of a prestigious Leningrad hotel. For three months her songs disappeared from the airwaves, and there were letters in some papers from factory workers demanding a ban on public performances by the singer. But her fans’ indignation was such that the ban was swiftly lifted. Perestroika at the end of the 80s, followed in the early 90s by the advent of Capitalism, was a catastrophe for most Soviet pop stars. For Pugacheva, always referred to as a ‘prima donna’, it provided, on the contrary, a new beginning. "Pugacheva is part of both Soviet and Russian history, and perhaps the only person to feel equally at home in both the USSR and Russia." She immediately took advantage of the new freedom to travel, and her first concert in New York’s Carnegie Hall won this comment from the New York Times: “Alla Pugacheva is a woman of many voices — delicate pop chirps, a clear rock mezzo-soprano, dramatic cabaret growls and sobs.” Ten year later, the same newspaper was to call Alla Pugacheva “Moscow’s Tina Turner, with a Hint of Edith Piaf”. But only in Russia could she feel like a Tsarina. She could drive through the centre of Moscow, including Red Square, in a carriage behind the traditional troika of three horses. Her latest marriage, to Armenian-Bulgarian singer Philipp Kirkorov, in St Petersburg was presided over by the city’s mayor Anatoly Sobchak. There was just one slight problem: the ‘civil status’ section of Pugacheva’s identity card was already full, and her new young husband’s name had to go in the ‘children’ section. Pugacheva’s concerts still attract considerably larger audiences than those of any other popular singer, even though there is not the same hype as before. 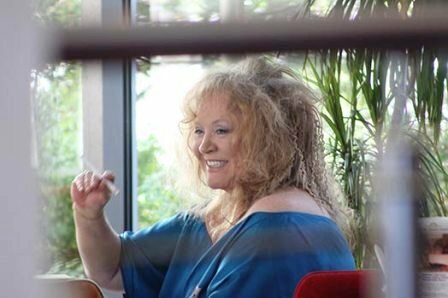 However Pugacheva’s career has also expanded into new areas: appearances on television shows, the teaching and promotion of young singers, and forays into business. Alla Pugacheva’s daughter Kristina Orbakaite has also become a popular singer, although she cannot compare with her mother. In one of her songs dedicated to Kristina, Pugacheva smilingly hints that she knows life so much better, and will always teach her daughter how to get her own way. In polls asking the public who they consider to be members of Russia’s elite, Alla Pugacheva sometimes comes second, after Putin, and sometimes third, after Putin and Medvedev. But she is still a controversial figure. Some people treasure her as the most perfect particle of their lost Soviet world still in existence. Others point to her vulgarity, enormous wealth and total loss of talent. It is difficult to find any critiques of her new songs, but you do not have to look far for a book entitled “The 100 Lovers of Alla Pugacheva”, or an investigation of her property wheeler-dealing. 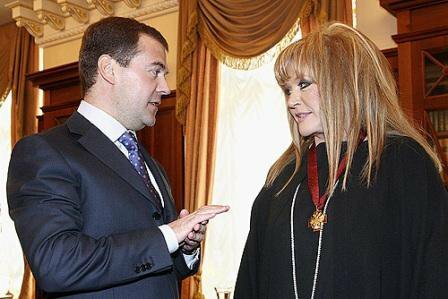 Pugacheva has also dabbled in politics before. In 2007 she announced that her vote would go to ‘United Russia’, because she wanted to vote for Putin. She did however state that she would not join the ‘universal wail’ – the calls for Putin to stay on as President for a third term, in contravention of the Constitution. “All my life I have managed to avoid becoming a member of any party”, she said at the time, although this did not stop her from joining ‘Right Cause’ when Prokhorov effectively took it over. Nevertheless, after some smart plotting saw Prokhorov thrown out of ‘Right Cause’, Pugacheva shouted from the conference stage that Vladislav Surkov, the man she considered responsible for the plotting, had "lost his mind". For her, Surkov was the embodiment of those party apparatchiks who harassed her in the 70s with their petty little games. Retribution followed swiftly. The NTV television channel, a proven instrument for dealing with enemies of Putin, and of course of Surkov, wasted no time in broadcasting compromising stories. They told of Pugacheva’s latest property acquisition, a palace in medieval style, "towering imperiously above the dilapidated hovels of the villagers", and whose courtyard boasted a glass pyramid, just like the Louvre. The next few weeks will no doubt bring Pugacheva more unpleasant moments, although she is unlikely to lose her palace. Neither can they prevent her from performing, although she has often announced her retirement. Pugacheva is part of both Soviet and Russian history, and perhaps the only person to feel equally at home in both the USSR and Russia.